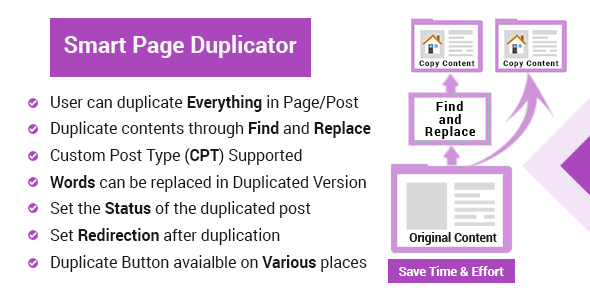 Smart Page Duplicator duplicate selected page/post with find and replace functionality. Most of the time Word-press Users needs to create a page/post which is slightly different than existing page/post. Instead of copying whole content and images which requires effort and time , Smart Page Duplicator comes to rescue to duplicate page/post with just one click to save effort and time. Smart Page Duplicator just not duplicate content BUT also provide options to change content during duplication. Most interesting and handy option of this plug-in is FIND AND REPLACE, which Word-press Users can use during duplication. With FIND and REPLACE option, Users can find any specific words in content and image titles to change it within same window with just one click. Forget about COPY & PASTE , switching tabs to copy content back and fourth. Custom Post Types, Custom Taxonomies and Custom Fields are also supported. Smart Page Duplicator also facilitate user to select which data of selected page/post you want to duplicate as well as which taxonomies and custom fields you want to duplicate. In short you can duplicate your post/page in your desired way. Enable the duplicate functionality for any CUSTOM POST TYPE (CPT). 6- Bloggers can use Smart Page Duplicator to speed up their work . It depends upon your requirements how you will use this plug-in. On users valuable feedback we will make it more better in latest versions.